One of the most relaxing Spinnaker Resorts tours this season is the Island Winery Tasting and Tour. Island Winery opened in 2006, bringing a variety of specialty wines to Hilton Head Island. The owners, Loren and Georgene Mortimer, make their wines with fresh fruits from Upstate South Carolina, U.S. Great Lakes region, Northern California and Curico Valley, Chile. Recently, I was lucky enough to take the short trip to Island Winery with the Spinnaker Resorts Activities Staff. As we entered the winery, we were surrounded by the aroma of sherry, oak, nuts and stewed fruit. 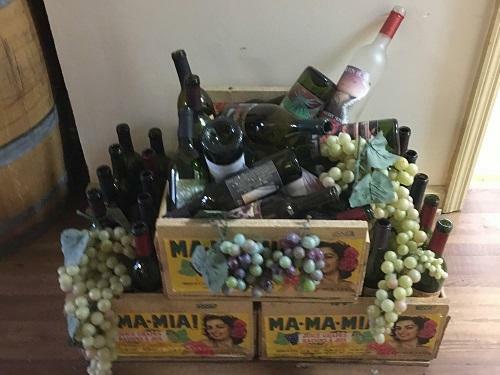 There is a bar set up for wine tasting (with munchies) and the bartender provided a menu listing fourteen varieties of wine; three white, six red, and five specialty wines. We could sample up to six wines and then have a glass of our favorite. 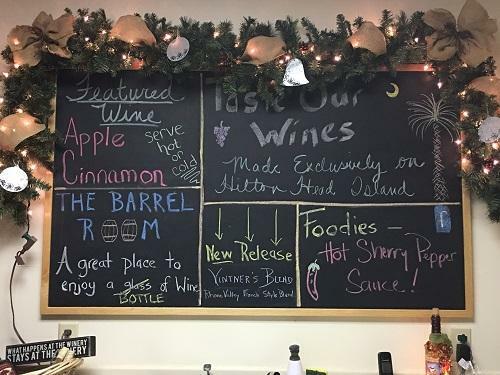 Since I have visited Island Winery on multiple occasions and sampled all 14 offerings, I have compiled a list of the five wines you must try before leaving Hilton Head Island. Vintners Blend: Not everyone will want a full glass of this wine, but I absolutely think everyone should taste it. Island Winery describes their Vintners Blend as a Rhone Valley French style blend, consisting of 2013 Amador Mourvedre (30%), 2013 Lodi Grenache (30%), 2012 Suisun Valley Syrah (30%), and 2012 Suisun Valley Petite Sirah (10%). It has hints of floral, black currant and a fruit forward finish. It is the Vintners Choice! This would pair well with a Lowcountry Boil. Riesling: Island Winery describes their Riesling as a semi-sweet wine, crafted from grapes that are sourced from the shores of Lake Michigan. It has a lovely citrus and honeysuckle finish. I am partial to Riesling, and this has become my new favorite. I like to pair this specific bottle with Salmon and grits. 2014 Cabernet: This Cab has hints of anise with a blackberry finish. It is aged in both French and American Oak barrels. This wine is food friendly, but also is a perfect happy hour sipping wine. I purchased a bottle for my relatives and they loved it. We paired it with delicious Lowcountry crab cakes. Peach on the Beach: This fresh Carolina peach wine is blended with crisp white unoaked wine. You can taste the sweet peaches, without it overpowering your senses. This Lowcountry specialty wine tastes delicious with old-fashion southern ribs. Harvest White Sweet Muscadine: A true Cotton Belt varietal, this white wine is crafted from Hilton Head Island grapes. It has a sweet, musky and fragrant summer taste. In my opinion, it would pair well with fried green tomatoes. After choosing a glass of our favorite, we walked to the back of the Winery into the barrel room. The barrel room is surrounded with barreled wine, each labeled by variety and vintage. There were five tables set with cheese pairings for our wine selections. We sat down to enjoy our wines and became better acquainted with each other until it was time to head back to Waterside Resort. 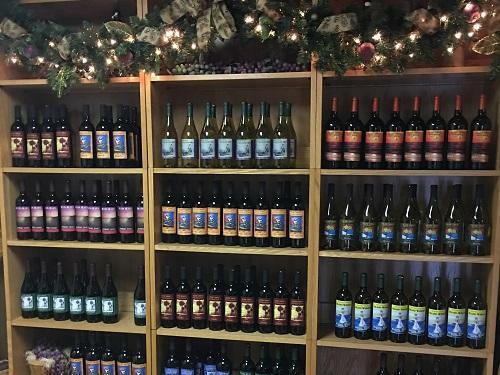 If you want to discover some great local wines but can’t join the Spinnaker tour group on Friday afternoon, you can visit the Island Winery tasting room any day of the week between 12:30 p.m. and 4:30 p.m. Monday through Saturday. Visit the Island Winery website for hours and seasonal featured wines. Share your favorite wines with us on Social Media!